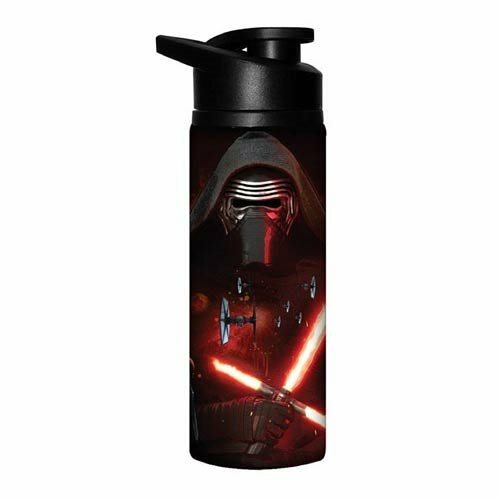 Shopping for Star Wars Water Bottles? The Empire still stands strong! This Star Wars: Episode VII - The Force Awakens Kylo Ren Space 25 oz. Stainless Steel Water Bottle shows the villain from the Star Wars: Episode VII - The Force Awakens film along with some Imperial ships, like TIE Fighters and an Imperial Transport. Holds up to 25 ounces of liquid. Hand wash only. Not dishwasher safe. Do not microwave. Measures approximately 9 1/2-inches tall. Ages 14 and up.